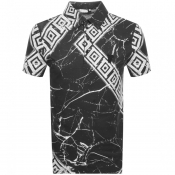 Versace Collection t shirts available to buy online at Mainline Menswear. This collection of tees ranges from cotton jersey crew necks to pique polos to suit every occasion. Available in classic colours such as black, white and navy as well as bright tones of red, blue and green. Mainline Menswear’s selection includes casual plain t shirts as well as tees featuring bold geometric prints and designs. All t shirts feature the signature Versace Collection Medusa logo to suit every style.